Moving into your first home is exciting! But it also means you’ve got work to do. 1. Change the locks. You really don’t know who else has keys to your home, so change the locks. That ensures you’re the only person who has access. 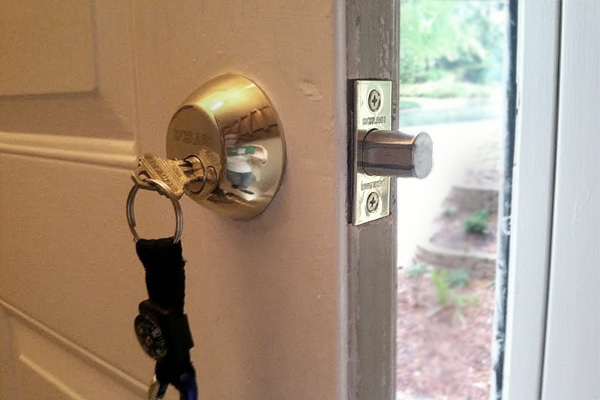 Install new deadbolts yourself for as little as $10 per lock, or call a locksmith — if you supply the new locks, they typically charge about $20-$30 per lock for labor. 2. Check for plumbing leaks. Your home inspector should do this for you before closing, but it never hurts to double-check. I didn’t have any leaks to fix, but when checking my kitchen sink, I did discover the sink sprayer was broken. I replaced it for under $20. Here’s a neat trick: Check your water meter at the beginning and end of a two-hour window in which no water is being used in your house. If the reading is different, you have a leak. 3. Steam clean carpets. Do this before you move your furniture in, and your new home life will be off to a fresh start. You can pay a professional carpet cleaning service — you’ll pay about $50 per room; most services require a minimum of about $100 before they’ll come out — or you can rent a steam cleaner for about $30 per day and do the work yourself. I was able to save some money by borrowing a steam cleaner from a friend. For my mousy enemies, I strategically placed poison packets around the kitchen, and I haven’t found any carcasses or any more poop, so the droppings I found must have been old. I might owe a debt of gratitude to the snake that lives under my back deck, but I prefer not to think about him. 6. Introduce yourself to your circuit breaker box and main water valve. My first experience with electrical wiring was replacing a broken light fixture in a bathroom. After locating the breaker box, which is in my garage, I turned off the power to that bathroom so I wouldn’t electrocute myself. You’ll want to know how to turn off your main water valve if you have a plumbing emergency, if a hurricane or tornado is headed your way, or if you’re going out of town. Just locate the valve — it could be inside or outside your house — and turn the knob until it’s off. Test it by turning on any faucet in the house; no water should come out.